Pilletopeltis sternbergi, from J. Barrande. 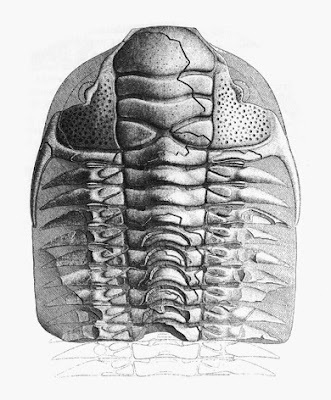 Pilletopeltis is a cosmopolitan genus of trilobites known from the Middle Silurian (Wenlock) to the Middle Devonian (Givetian) (Přibyl et al. 1985). Characters (from Přibyl et al. 1985): Transglabellar furrows 3S and 2S present; median furrows on hypostome relatively shallow; pygidium with long anterior pleural spines and reduced second and third pairs; unpaired medial spine fused with terminal piece and shifted near to anterior margin of pygidium, occasionally only a sligh mucronation discernible in sagittal axis.